In 2-quart saucepan, cook ground beef over medium-high heat 5 to 7 minutes, stirring occasionally, until thoroughly cooked; drain. Reduce heat to medium. Stir in remaining ingredients except shredded cheese and tortilla chips. Cook 8 to 12 minutes or until thoroughly heated, stirring frequently. 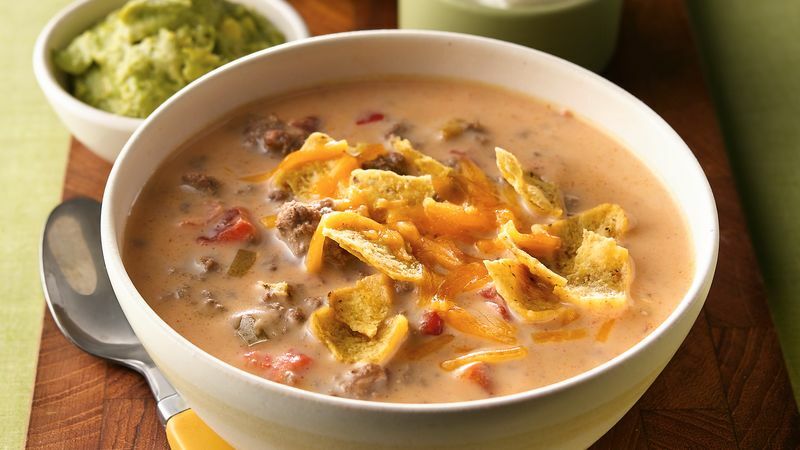 Top individual servings with shredded cheese and tortilla chips. Offer other favorite nacho toppings for the soup, such as tomatoes, bell pepper, green onions, sour cream, guacamole and/or ripe olives.